Place cheese in small round dish of roughly the same size. Pierce the top of the cheese in several places with a sharp knife and insert pieces of garlic into the slits and drizzle with olive oil. Bake in the oven for ten minutes, or until the centre of the cheese is melted. 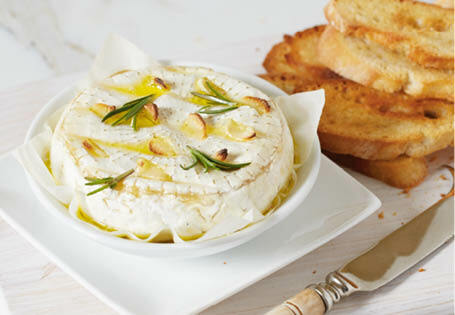 Slice the bread, drizzle with olive oil and toast.Serve with the warm cheese for dipping. Cranberry sauce is a great accompaniment for baked camembert.